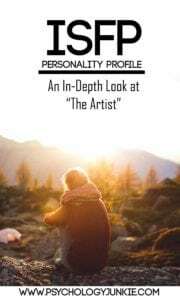 ISFP personality types are known for their intriguing mix of creativity and practicality. They aren’t just dreamers, they’re “doers” as well. They combine a love of beauty and possibility with an intense inner perfectionism that isn’t always obvious to the outer eye. They make up 8.8% of the US population and are one of the less frequent sensing types. To get a clear sense of how an ISFP thinks and processes life, let’s start by taking a look at their cognitive functions. ISFPs are always looking inward to their value system to find out what’s important to them, what’s right and wrong, and what they really believe in. Their most preferred mental process is called Introverted Feeling, or “Fi” for short. This process is concerned with values, personal ethics, and authenticity. ISFPs have values that come from a gut level. What society dictates isn’t the defining factor to them, they seem to just know what is right and wrong on an individual level. They tend to be private, empathetic people. They often have a soft spot for the underdogs of the world, and many pursue careers where they can take care of people who are suffering. According to the MBTI® Manual, they are overrepresented in health care, nursing, and law enforcement and use these careers as a way to protect people, and provide practical service to others. ISFPs have an inner awareness of when people are being authentic or phony and are skilled at sniffing out hidden motives. They can sense emotionally supportive or unsafe environments and will try to protect themselves and others from people who are emotionally abusive, manipulative, or dangerous. ISFPs have a sense of right and wrong that they can’t always explain in words. It appears more in action rather than words, or in creativity. 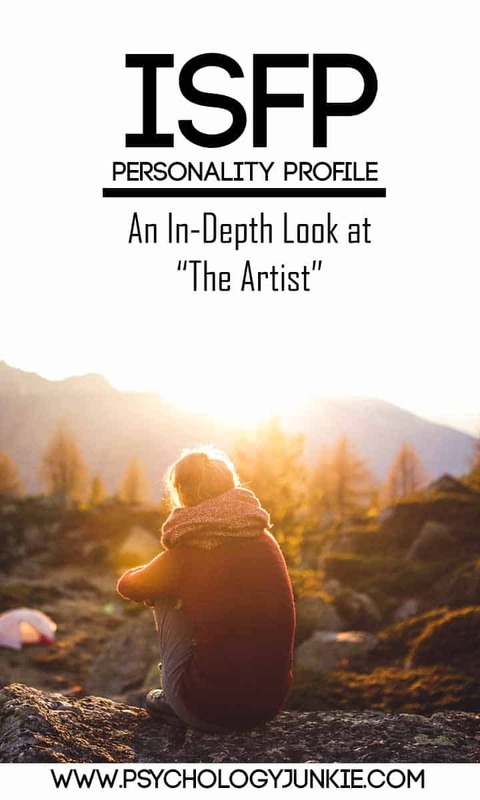 Many ISFPs use art, music, or their work to express their beliefs and feelings. Sincerity is paramount in everything they do. ISFPs are feeling types, but they have a reserve and inner serenity that differentiates them from many other feeling types. They tend to keep their feelings tucked inside and share them with only a trusted few. On the outside they may seem stoic, mysterious, or even cold. Yet on the inside they are warm, empathetic, and deeply passionate individuals. They also tend to appear easy-going and laid-back to other people, but inside they are often perfectionists who hold themselves to extremely high standards. As introverted feelers, ISFPs deeply dislike being labeled, micro-managed, or given a lot of rules to live under. Rules have to feel right to them and have to align with their values to be given a priority, and a rigid structure feels confining to them. They especially dislike when people say things like, “I’ve got you figured out” or “You’re this way”. Unless someone is very close to them, and has really taken a lot of time to listen to them, they are unlikely to know who they really are at all. ISFPs balance and support their feeling function with a process called Extraverted Sensing, or “Se” for short. Extraverted sensing is extremely detail-oriented and realistic in its focus. This is why I like to call ISFPs “Practical Dreamers”. They don’t just want to sit with their idealism and integrity, they want to make a difference with it. They are experiencers and adventurers. Their desire for experience and adventure can take them to new places, on recreational pursuits, or even into the excitement and thrill of a video game. Personally speaking, I’ve come across many ISFP gamers or movie buffs who enjoy a more “digital” sensory experience. Still others I’ve met are more focused on overcoming physical feats or spending their time in nature. ISFPs tend to have a finely-tuned awareness of the details of their current environment or situation. They try to stay tuned into the moment and find opportunities or experiences that can heighten the moment and make it more enjoyable. They take stock of what’s around them and are usually very resourceful and quick-witted when they are in a crisis or have to respond suddenly to changing events. Extraverted Sensing gives the ISFP a very practical, earthy demeanor. They try not to take themselves, or others too seriously, and usually have a good sense of humor. They look for fun, enjoy flexibility, and enjoy adapting to and finding the pleasure in everyday experiences. They don’t see the point in wasting today worrying about tomorrow. ISFPs find relief and enhance their creativity through the use of their tertiary function, Introverted Intuition, or “Ni” for short. Ni is focused on underlying meanings, symbolic significance, and big picture, future implications. In early life, Ni isn’t very well-developed for ISFPs, so they may not access it very often. They may get vague senses of “knowing” that they can’t quite explain or find themselves creatively daydreaming about the future impacts of their current choices and paths in life. As ISFPs grow and develop, they become much more adept at accessing Ni. They may become increasingly perceptive of underlying, hidden meanings and start to see the power in symbolism and patterns. They learn how to switch perspectives to change their point of view on things and to gain deeper insights into situations and people. Because ISFPs prefer sensing over intuition, they still tend to trust the tangible world the most and focus most of their energy on their values and the experiences they gather there. However, the older they get the more they balance this with an insight into intrinsic patterns and connections that may be unrelated to external reality. The inferior function of the ISFP is Extraverted Thinking, or “Te” for short. They use this function when they need to organize their environment or make decisions in an objective, logical way. Because this is their weakest primary function they can have difficulty accessing it in an effective way, especially in early life. They tend to focus first on their values, what’s important to them, and how to stay authentic when making a decision. Staying objective and impersonal and simply focusing on the facts can be difficult, especially if it doesn’t feel right or it might impact other’s in a less-than positive way. Under stress, ISFPs may overuse feeling and sensing and as a result fall into the grip of their inferior thinking function. When this happens, they can become uncharacteristically critical, focused on organizing and fixing problems, and righting wrongs. Because they feel bad being outwardly critical with others, they may engage in destructive fantasies where they tell people exactly what they think. This tends to only frustrate them more, though. You can find out more about their stress reactions here. As ISFPs develop and mature, they will use Te to draw conclusions about their external circumstances and their feeling will provide a subjective response to those thinking judgments. This allows them to see potential injustices and notice situations that are unfair. They will also use Te and Fi together to discern which external rules are worthwhile and logical. Because Te is so unconscious for the ISFP they may struggle with speaking their mind, forming judgments, and asserting their position. They are more likely to address situations through action (sensing), rather than try to organize other people or direct them. ISFPs are extremely sincere, fun-loving, and compassionate partners. They tend to take their relationships seriously and work hard to ensure their partner is listened to and appreciated. A common struggle for ISFP partners is that they have difficulty expressing their feelings when they are angry, resentful, or upset about something. They despise conflict and don’t like instigating it, so they may stew on negative feelings for a long time and find it difficult to get their needs met. Thoughtfulness is a trademark of the ISFP partner. They show their thoughtfulness by paying close attention to what makes their partner laugh, smile, or enjoy themselves. Then they will try to find as many experiences like that to enjoy together. The most important aspects of a relationship to them include mutual commitment, having fun together, companionship, shared values, being listened to, and intimacy. In a relationship, ISFPs need someone who won’t stifle them or force them to conform to a pre-ordained image of how a partner is “supposed” to be. ISFPs need alone time, and they also need adventure and experience. They will quickly tire of a partner who talks down to them, makes them feel caged in, or doesn’t listen to their thoughts and feelings. A realistic, fun-loving, affirming partner is the ideal for this type. Authentic: ISFPs believe in following their own course in life and don’t believe in portraying themselves to be anything other than who they really are. They are sincere individuals who highly value trust and honesty in themselves and others. Strong Value System: ISFPs check in with their moral compass on a regular basis to try to determine if something is right or wrong. Their values are molded and formed subjectively, which gives them a certain independence and free-spirit. Fun-Loving: ISFPs know how to enjoy the moment and are always on the lookout for new adventures, opportunities, and experiences they can immerse themselves in. Sensitive and empathetic: Healthy ISFPs are extremely empathetic and compassionate, especially towards people they feel are “underdogs” or outliers in some way. Observant: ISFPs are very in tune with the details around them and use this awareness to “read a room” or notice details that other people frequently miss. Attentive: ISFPs are usually very good at listening to people without constructing their own comebacks at the same time. They are also good at detecting authenticity levels in others. Creative: ISFPs tend to be very creative individuals. Often they express their creativity in hands-on ways, through art, dance, crafts, or caretaking. Overly-Sensitive: Some ISFPs can be overly sensitive, and they may get offended by constructive criticism and see it as a personal attack. Struggle with Long-Term Planning: Because ISFPs prefer to live in the moment and adopt a more impulsive lifestyle, they can struggle with foreseeing long-term implications or “looking before they leap”. They tend to develop stronger ability in this area in mid-life. Repulsed by Rules: Rules aren’t always a good thing, but ISFPs can be so against any kind of rule or limit that they get themselves into scrapes that could have been avoided. They may also feel oppressed by structure. Logical Decision-Making: ISFPs can focus so much on their values or maintaining harmony that they lose sight of the objective logic involved in making a decision. They can have a hard time giving constructive criticism or delegating when the time calls for it. – In a national sample, ISFPs were among the highest reporting stress associated with “Finances” and “Children”. – ISFPs are among the highest persisters in college. – ISFPs prefer practical skills the most of all academic subjects. – ISFPs show occupational trends in health care, business, and law enforcement. – In national sample “Leisure Activities,” overrepresented in “Watching TV three or more hours per day” and “Watching TV for leisure”. Do you have thoughts or ideas about this article? Let us know in the comments! Is Audrey Hepburn an INFP or ISFP? Micheal Jackson is ISFP..his connection with children is misused by some parents to get money from him. Yes we INFPs don’t ant to do anything with our ideals and just dream about them. We don’t want to make any change! If we are not doing anything, doesn’t mean we r fine with it. It is difficult to make others understand our view first.